Preheat oven to 375. After cooking Italian sausage, drain on paper towels. Roll pizza dough out onto a greased pizza pan. 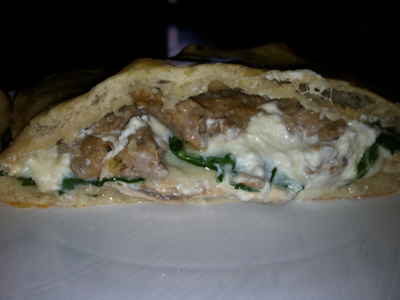 On one half, layer mozzarella cheese, mushrooms, provolone slices, spinach and then “dollop” the ricotta mixture on top. Fold the top half over onto the bottom, and press to seal the edges. Brush the top of the calzone with the egg wash. Make three slits at the top to allow steam to escape. Bake for 25 to 30 minutes. Serve with your favorite marinara sauce, for dipping!